Brad Paisley is one of hundreds of Nashville’s top stars, working musicians and tour support company owners who lost what will likely be millions of dollars in gear due the historic floods in Nashville. 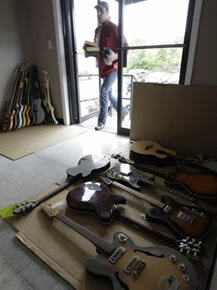 Paisley is one of an estimated 1,000 musicians and business owners who house gear at Soundcheck Nashville, a storage rental hub in an industrial park down by the Cumberland River. Owner Ben Jumper said the 160,000 square feet of space he rents out is all flooded and the losses will be in the tens of millions. The storage facility is full of classroom-sized “lockers” used to store gear. Keith Urban lost his gear. Friends say Vince Gill may have lost most of his entire guitar collection, including irreplaceable vintage pieces with historic value. A tractor-trailer full of LeAnn Rimes’ road gear is also probably under 3 1/2 to 8 feet of water, her guitarist Ryan Wariner said. Wariner is trying to be optimistic, but there’s not a lot of reason for hope. “Everything that I use but two guitars is in there â€” pedals, amps, speakers, mics, front house consoles, everything was in there,” said Wariner, son of Grammy-winning country artist Steve Wariner. Among those donated to the hall of fame were a Fender Stratocaster that belonged to Jimi Hendrix, a Gibson Les Paul played by the Who’s Peter Townshend, and one of Johnny Cash’s guitars. Genuine Hendrix owned Strat for sale at Vintage and Rare! My good friend Nicolai has a genuine Jimi Hendrix owned 1967 Fender Stratocaster for sale through one of his dealers (Rock Star Guitars) at his website, Vintage and Rare. 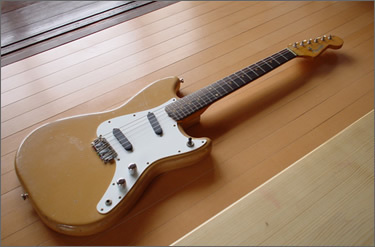 This sunburst guitar was given as a gift by Jimi in late 1968 to James “Tappy” Wright, who was a member of his management team along with Chas Chandler, of the Animals, who Tappy was also road manager for. The guitar is currently on display in the Nashville Musicians Hall Of Fame and Museum and was the subject of various lawsuits over the years as the Hendrix estate tried to claim back ownership. These lawsuits are now all settled, and the guitar is available for sale with full legal backing. The historically interesting guitar is for sale for Â£260,000 and you can read more and see other photos on the vintage and Rare website. I found this interesting little article yesterday; A subject close to my heart as I have a fair few “famous” guitar picks from my time working at Wembley Arena in the early 1980’s. Unfortunately, many were unbranded, and over the years I have forgotten who owned what – It’s a shame that Angus Young and George Benson both favoured identical picks! I do have a few nice ones though; Rick Nielson from Cheap Trick, JY and Chuck from Styx, and a cool one that says “misplaced by Mick Jones” from Foreigner. If youâ€™ve ever wondered what all those guys were doing, eyes cast down, shuffling their tired feet, milling about at the front of the stage after Van Halen were safely in their buses and on the way to the next cityâ€¦ well, they were probably looking for guitar picks. Collecting custom imprinted picks is a collector craze that is still in its infancy but growing. Scott Roderick from www.swag.com, the biggest pick retailer in the world, thinks itâ€™s catching on quicker than James Hetfieldâ€™s pick-clutching right hand. â€œGuitar-pick collecting started off as a very cult-ish hobby and probably started gaining credibility somewhere around the mid-80s,â€ said Roderick. â€œA lot of stuff isnâ€™t documented. Once again, itâ€™s still somewhat a new hobby. 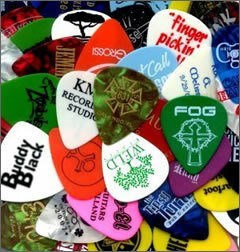 But actual signature guitar picks, from bands, really started probably in the late â€™70s, with bands like Van Halen. These old white on tortoise, or block black print on white are some of your earlier styles. And there were a few, Ted Nugent, I believe, had one, J. Geils; there were a handful of acts. But generally theyâ€™re block-type prints, very plain-looking. Itâ€™s the same as with backstage passes. You look at the old backstage passes, and there arenâ€™t a lot of graphics. Basically itâ€™s somebodyâ€™s stamp; not very graphically pleasing. But those are some of the first ones. â€œThere are really just a handful of companies who actually make these for the bands, one being Jim Dunlop, also Dâ€™Addario, Dâ€™Andrea,â€ explained Scott, when asked about print runs of something like a guitar pick. â€œThose of the three major players. There have been others whoâ€™ve come and goneâ€¦. plus Ernie Ball was in it for a time. They donâ€™t even have records or samples of something that they printed 20 years ago. Nobody ever thought â€” and Iâ€™m speaking for them; they would be the ones to really ask to get the best answer â€” but they didnâ€™t even think that this would be something people would think about collecting. 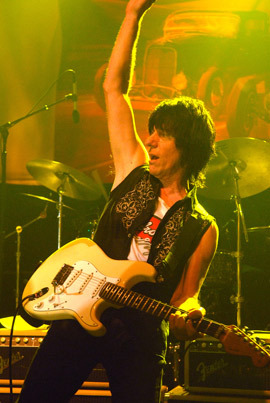 Guitar hero Jeff Beck has insured each of his fingers for Â£700,000 after accidentally chopping off the tip of one digit. The 65-year-old had his mishap as he sliced carrots at his home in Sussex, reports The Daily Mirror. Doctors sewed the tip of his left index finger back on but then he struggled to finish his new album Emotion and Commotion. Therefore, he has now raised his insurance cover on his hands five-fold – making his 10 digits worth Â£7million. 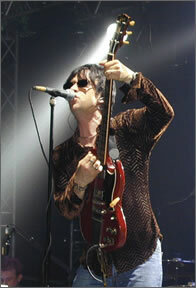 A source close to the former Yardbirds star said: “Jeff was making a stew when he cut his finger clean off. This is a personal one for me.. 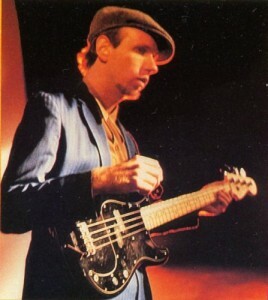 I was deeply saddened to hear of the passing of one of my all time bass heroes, T-Bone Wolk last week. Hall and Oates were one of my favourite bands for at least 20 years, and I saw them live on numerous occasions, always with T-Bone laying down the groove. 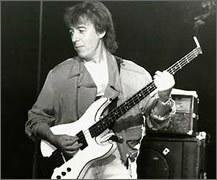 As a bass player he was a massive inspiration to me and I spent many hours working out his licks and stealing his grooves. He was one of the busiest session musicians in the industry, having worked with some of the most popular artists in the past and the present, includingÂ Bette Midler, Carly Simon,Â Billy Joel,Â Robert Palmer, andÂ Avril Lavigne among the artists he had worked with. RIP T-Bone…the bass world won’t be the same without you. Reb Beach was the guitarist with hair metal band, Winger, who achieved a reasonable level of fame in the late 80’s and early 1990’s. More recently he has been a member of David Coverdale’s Whitesnake. This is signature guitar produced by Ibanez in the early 90’s is probably the guitar Reb is most closely identified with, in particular in his Winger days. Designed by Reb “on the back of a napkin on a plane flight when I’d had quite a bit to drink!” the guitar’s design echoes design features of some of Reb’s favourite guitars of the time, in particular the Steinberger GM model with its rear cutout. The RBM1 and RBM 2 were the original Japanese models and later came the RBM 10 and 400. All Designed by Reb himself, the Voyagers combine great looks with a good tone. 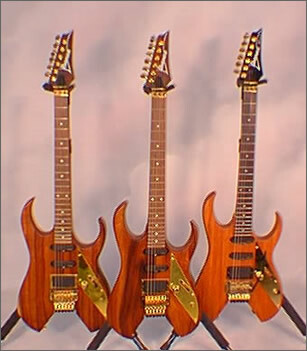 They were made with a Hawaiian Koa top on a mahogany body and a 22 fret maple neck with Bolivian rosewood fingerboard (also known as Pau Koa) and round clay dot markers. 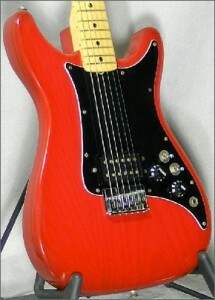 The RBM model was Made in Korea at the Cort factory, and is pretty rare today. 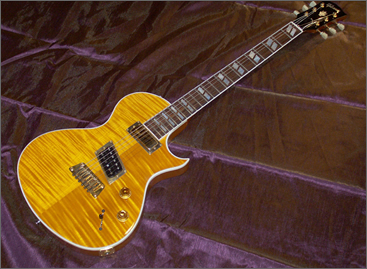 Quality is good, (being an Ibanez guitar) and the body shape is unusual without being too outlandish. I came across this interesting clip today..I had no idea he was into guitars. Then again, being English, I don’t get to see Â his show very often anyway and I guess I won’t be seeing it in the future either! Being a big rockabilly fan he has his focus on Gretsch guitars…enjoy! It is with great sadness that Carvin announces the passing of it’s founder, Lowell C. Kiesel. 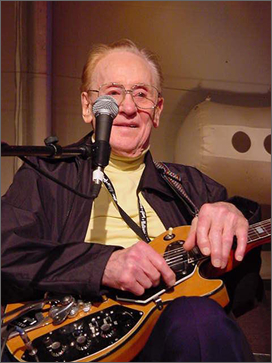 Mr. Kiesel was born in Nebraska in 1915, and as a young man, spent time in Wichita, Kansas, where he developed an interest in musical instruments; specifically, Hawaiian steel guitars, resonators and the electronic aspects of these instruments. He founded the L. C. Kiesel Company in 1946, and began winding pickups on an old sewing machine owned by his wife, Agnes. The company was located in Los Angeles, briefly relocated back to Mr. Kiesel’s home state of Nebraska, and then moved back to southern California in 1949, where the name was changed to Carvin, after his two eldest sons, Carson and Gavin. In the following years, the company expanded from pickups to guitars and basses, amplifiers, pro audio equipment and other musical accessories. Mr. Kiesel’s leadership, technical expertise and innovative engineering concepts led the company for decades, and even after handing the reins of the company over to his sons, he maintained an office in Carvin’s San Diego headquarters and remained active in company operations. 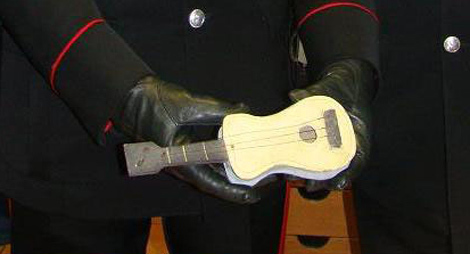 A small guitar which Pablo Picasso had sculptured as a gift for his daughter Paloma has been recovered by the Italian Police. The Â Police state that Picasso had given the toy to his friend Vittorio Parisi. Two years ago, Parisi, at the age of 92, handed over the little guitar to an Italian businessman and amateur artist who had promised to build a glass showcase for it to be exhibited at the civic museum on Lake Maggiore, but it was never seen again. 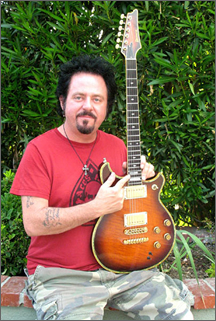 After Parisi’s death in January of 2009, his widow asked police to try to find the famous guitar. She alerted them that the “Little Guitar” was still in the hands of the businessman.Â Police say the unnamed businessman never returned the work, keeping it in a shoebox in his home. 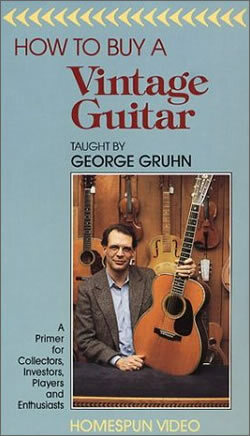 The guitar has never been valued, but is considered to be very valuable because of its originality. The Italian businessman now faces fraud charges and a 3-10 year prison term. 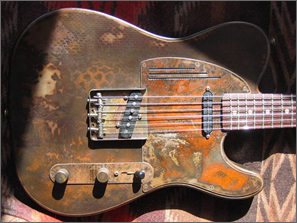 Most guitar collectors will be aware of James Trussart’s wonderful metal bodied creations. The expensive hand-produced Telecaster, Jazzmaster and Les Paul shaped works of art are all individual; some are painted, some are bare metal, some are rusty, some a re a combination of all of these. The article below is a fascinating look behind the scenes of the Trussart LA workshop. 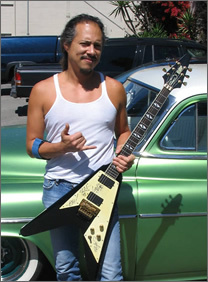 The Jackson Roswell Rhoads was a very rare, limited edition guitar made in 1997. It was a limited run of 123 guitars, and was a twist on the classic Jackson Randy Rhoads shape, with a UFO theme running through it. The body, instead of being made from wood, was made of 6061-T6 aluminium, an aircraft-grade metal which was hand-carved and polished in the Jackson Custom Shop. 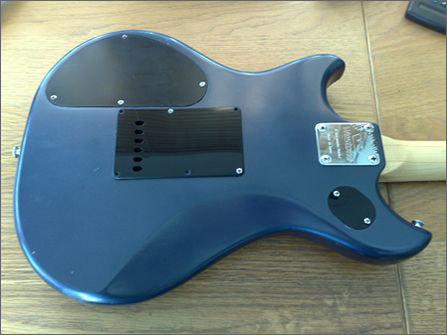 The guitar featured a single humbucker and a fixed bridge. 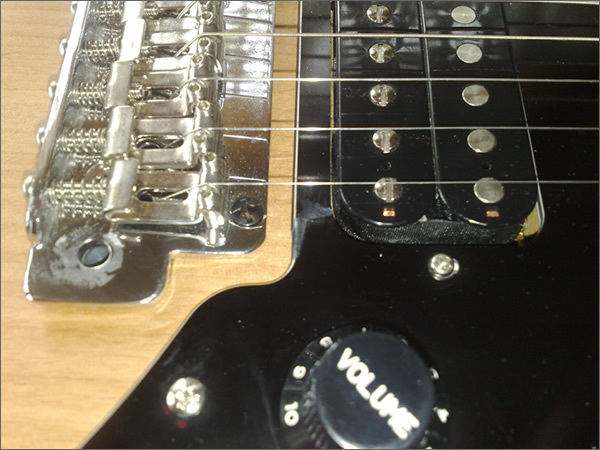 It also had a set maple neck with a satin grey finish, and the tuners were unusual LSR gearless types. 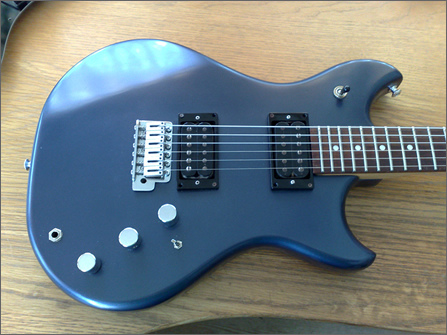 The Roswellâ€™s body shape was based on the popular Randy Rhoads shape drawn up by the late guitarist in 1980, but the famously angular, pointy shape of the regular RR model was ditched in favour of a much more curvy design, which kept the basic shape but warped the body into an asymmetrical â€œUâ€ shape as opposed to the regular modelâ€™s offset V shape. The inlays were crop circle designs, befitting the alien/jet age theme of the guitar. The name was taken from the location of a supposed alien space craft crash in the 1947, Roswell, New Mexico. The original Roswell Rhoads was only built for a short time, in incredibly limited numbers, but has gained a cult following. The shape is still available, although only through Jacksonâ€™s custom shop, and if you want one youâ€™ll have to settle for wood instead of aluminium. The Roswell was priced at a truly huge Â£3,999 when it was launched 13 years ago, and original, aluminium-bodied examples fetch even more than that today; Gbase currently have one for sale at $5000. 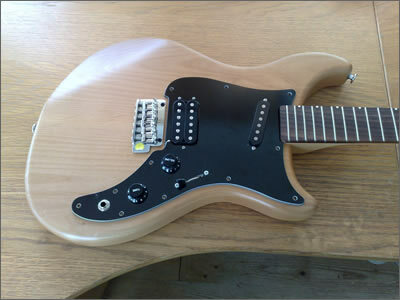 There is, however, a more mainstream guitar which retains the same kind of shape as the Roswell and comes at a much less extravagant cost, in the form of Gary Kramer Guitarsâ€™ Kramertorium model. 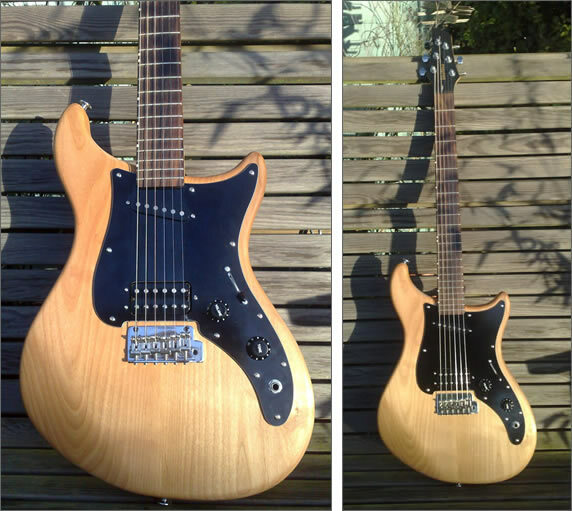 This is a newer model featuring a Floyd Rose tremolo and EMG pickups, for a price of around Â£500. If you canâ€™t find a Roswell Rhoads or donâ€™t have the money, this new guitar could be a very realistic alternative. Iâ€™m one of those people that is always in search of the next cool guitar so I frequent all of the Las Vegas pawn shops, music stores, Craigâ€™s List and of course Ebay. Iâ€™m also an avid reader of several musician magazines including Vintage Guitar Magazine, Premier Guitar and Guitar Player, which help keep me current on vintage and new guitar gear. This all began back on September 10th when I was contacted by a pawn shop that I had bought several other guitars from in the past, about a Lucille they had for sale and wondered if I would be interested. 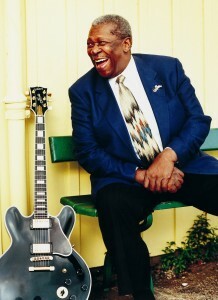 Being a huge fan of BB King of course I was. On the phone they told me it was an 80th Birthday Lucille model which I had never heard of! So I started doing research with anyone and everyone I knew that could help me out. I found out from Gibson, that 80 of them were created for BB Kingâ€™s 80th Birthday in 2006 and that they sold new for almost $10,000. Each one was issued with a letter from BB King also and only 44 were sold in the US. As you can imagine I was pretty hyped up. When I got to the pawnshop I was disappointed to find that the guitar had been gigged hard, was covered in filth, had pick scratches and even some small dents from being played. The shop would not budge on the price. It did not have certificates and the case wasnâ€™t the original. I flipped the guitar over and looked at the headstock expecting to see the standard serial numbers. 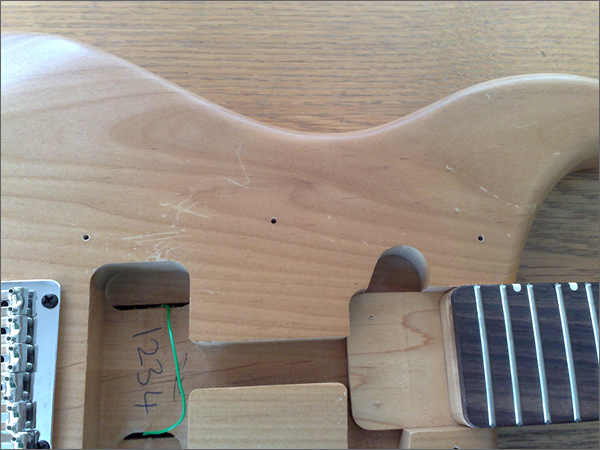 To my surprise â€œPrototype 1â€ was stamped just below where the headstock serial should be. I figured this was a fake or a really cool piece that had once been approved by BB King then given away to a fellow musician, friend of the family or relative. Of course I bought it and took it home and cleaned on it for a few hours trying to buff off the grime and scratches, oiled the fret board and put on new strings. That is when my research really began. I couldnâ€™t find anything about the 80th model in my Gibson or Gruhn reference books, just a few stray articles on the web. I contacted Walter Carter, the author of numerous guitar reference books and part of Gruhn Guitars in Nashville; he had no idea and had never seen a stamp like that on back of a guitar. Then I contacted my Guitar Center friends here in Las Vegas and in LA, still no idea. 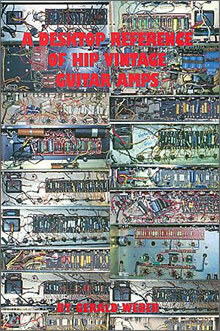 Even sent pictures to Wally Marx, writer for Vintage guitar and Premier Guitar, and he had no idea. 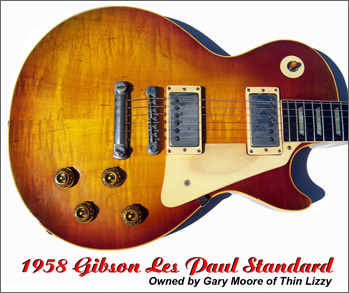 So I went back to Gibson customer service and played e-mail tag with Bob Burns for two months trying to find out if this was a prototype, if so did BB play and approve it, who built it, and how much it was worth? I was pretty much at my wits end and was ready to give up the quest. 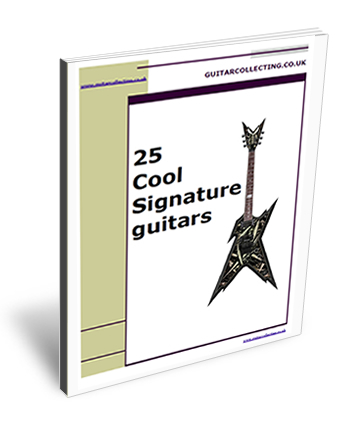 One day I was doing a guitar search on the web for a different guitar and found a contact with Blue Book Publications. It ends up heâ€™s the owner of the company, Zachary Fjestad, super nice guy and flipped him pictures of my 80th Lucille. He sent me more information than anybody else did all the way from Minneapolis, Minnesota their corporate headquarters! I kept bugging Gibson every week too and my contact told me that he had a guy there at the custom shop that knew something about my guitar and he was going to call me. Finally on November 9th I get a call from Pat Foley, he is the Gibson Artist Relations Director out of Nashville. I assumed he was calling me up to give me some juicy details on the guitar and did he ever. First off he asked me if I still had the guitar here in the United States, which kind of seemed odd to me since where else would I keep it? Then I started asking him a series of questions as well. It ends up the guitar was stolen from BB King, the beginning of summer 2009. 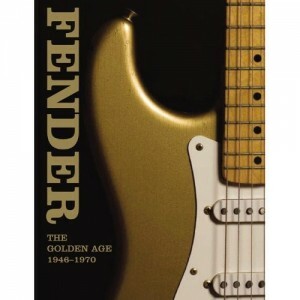 The guitar had been presented to BB in 2005 by Gibson for his 80th birthday present in Los Angeles. Also this was Mr. Kingâ€™s main gigging guitar for the last four years and he was so upset when it was stolen that he asked the Gibson Custom shop to make him as close a replica as possible. Mr. Kingâ€™s people and Gibson were very pleased that I did not try and sell this to a collector in Japan and that I was more than willing to return it to Mr. King the rightful owner. In appreciation BB and his Assistant, Lavern Toney worked with Gibson to have a guitar present for our meeting on November 30th at 3pm yesterday. Mr. King exceeded my expectations with his friendly greeting. He kept thanking me and shaking my hand and was so happy to get his Birthday present back that was stolen from him. I got the experience of a lifetime to meet Mr. King in person and talk to him for 45 minutes. Plus he signed a Lucille to me, gave me some BB guitar picks to use and signed my BB King Treasures book. He wants of a copy of our picture together to put up at his office. 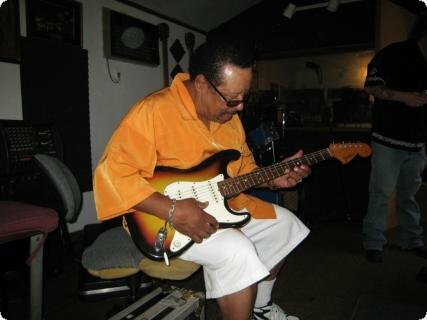 Iâ€™m just happy that I was able to return a prized guitar to one of my guitar idols and inspirations so he can continue to give joy to so many other blues fans around the world! This is interesting. 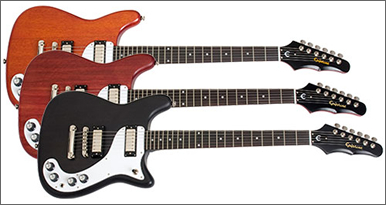 The Blackbird Rider travel guitar is now available in a special Ferrari version. The body is a one piece carbon fibre monocoque, just like an F1 car and the design is unique to say the least. 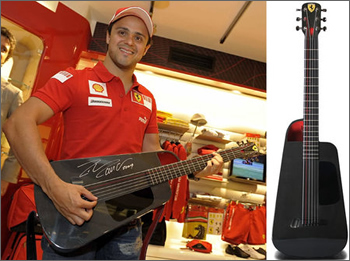 I have never seen or heard of these guitars before but they seem pretty good, (watch the video below) and Felipe Massa certainly looks pleased! The Blackbird Rider Ferrari Guitar costs $1,500 and has a red A string and a Â Maranello red interior, which is cute. I thought you may be interested to see this. 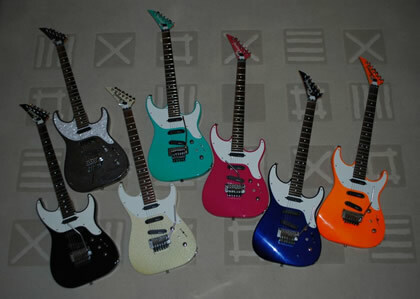 A high end guitar collecting friend of mine has a guilty pleasure.Â Collecting Charvel Spectrums! His addiction has been satisfied for the time being, with the arrival of a black model from Australia, although he is making noises about the lack of maple necked models. He has also persuaded a few collecting friends of his to indulge too, and between them the Spectrum collection is now in double figures. So what's all the fuss about? The reason is,Â these are great guitars... versatile, with an extra tone eq pot and great for gigging with. They have an 80's vibe about them (don't get too near that pointy headstock! 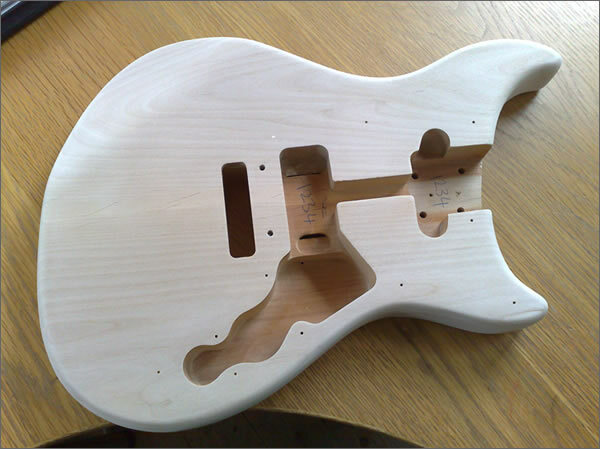 ), and the quality of the construction is undeniable. The sparkle finish model (top left) is a special order, but the rest are all original. These are still pretty cheap guitars, in the Â£300-500 price range, but prices are steadily climbing, probably due to my mates hoovering them up at a rate of knots! 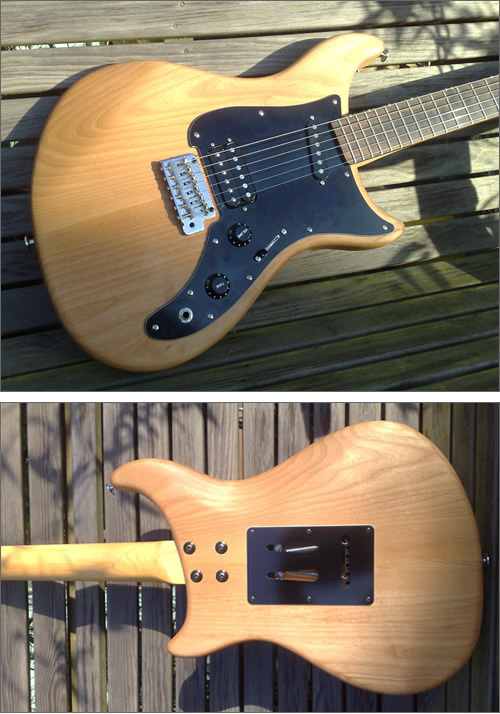 If this style of guitar is of interest to you I'd start looking soon. As always, I'd recommend going for originality and Â good condition to help safeguard future values, but I'd be quick, because as soon as funds allow I'll be out there looking for an orange one too! In the meantime, here's a little bit more information about Charvel Spectrums. I found this interesting video yesterday. I’d never considered doing this myself. but it’s given me a few ideas..
Taylor Swift now has her own signature model guitar to be built and distributed by Taylor Guitars, the renowned acoustic and electric guitar company founded in 1974. She joins Leo Kottke, Doyle Dykes and Dan Crary as artists who have a signature model built by the company. 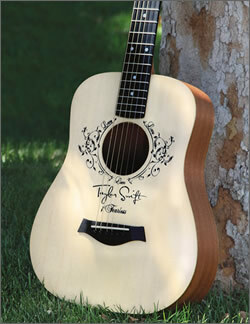 The Taylor Swift Baby Taylor guitar is based on the best-selling Baby Taylor guitar and is ideal for both promising players and accomplished pickers. At three-quarters the size of a standard dreadnought, with a slim 1 11/16-inch neck and a comfortably compact shape, the guitar is just right for both the littlest playerâ€™s hands and anyone who likes to pick up and play on the go. The top of the special-edition instrument is decorated with a screen-printed rosette design and the word “love” three times within a vine motif. It also includes the title of her latest album, Fearless, and her signature near the bridge. The guitar’s list price is $398, but it is expected to be sold for around $299 when it becomes available later this month. Bill Wyman, the former bassist of the Rolling Stones, has claimed that Guitar Hero, Rock Band and other music games discourage children from learning real instruments. His criticism comes on the eve of the release of Â ‘The Beatles Rock Band’ computer game, which allows players to play along with to band’s back catalogue. However, he also confessed he wouldnâ€™t mind his bandâ€™s tracks being used on such games as they provide a new audience for their songs, adding, â€œI think everyoneâ€™s looking at new ways of selling the music because the business of selling records has almost disappearedâ€. 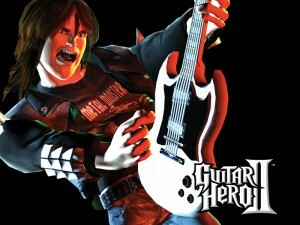 Alex Rigopulos, one of the co-founders of the company that creates the Rock Band games, defended his product and claimed, â€œWeâ€™re hearing from fans who were inspired by Rock Band to start studying a real instrumentâ€. The Guitar Hero series alone has sold more than 25 million games globally collecting revenues of $2 billion and can claim Simon Cowell among its celebrity fans. 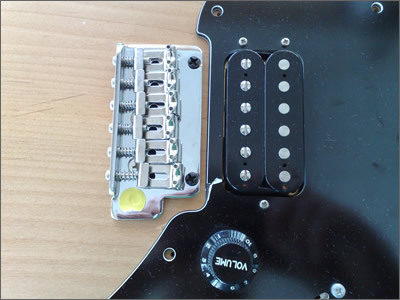 A number of websites have cropped up that claim to be able to provide visitors with information about their guitar via its serial number. 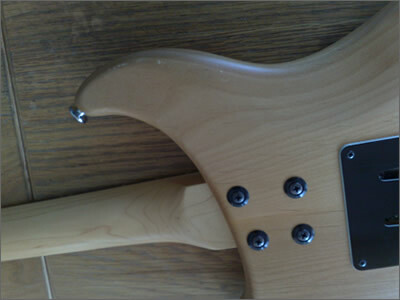 This has misled some guitar owners into believing that their counterfeit guitar is an authentic one. In fact, some counterfeiters or sellers of these fakes now even refer potential buyers directly to one website in an effort to verify the ‘authenticity’ of the fake guitars theyâ€™re peddling. 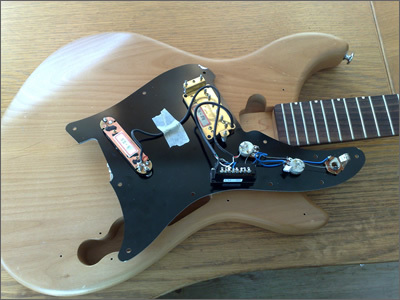 Web sites such as Guitar Dater Project also claim to be capable of identifying Fender, Ibanez and Yamaha guitars. Olsen wanted to be clear that this site and others like it â€” intentionally or not â€” are perpetuating the counterfeiting epidemic, one that is built on this kind of misinformation. With the years of shipping records in manufacturer’s books and dozens of variations on numerical schemes used across the years, decoding serial numbers isnâ€™t an art that any one guitar aficionado, or piece of software, can undertake. 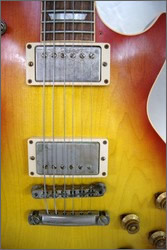 “Although Guitar Dater Project may correctly identify a guitar here and there based on historical data uploaded, it is a very unreliable way to truly identify and authenticate a Gibson or Epiphone guitar,â€ said Olsen. 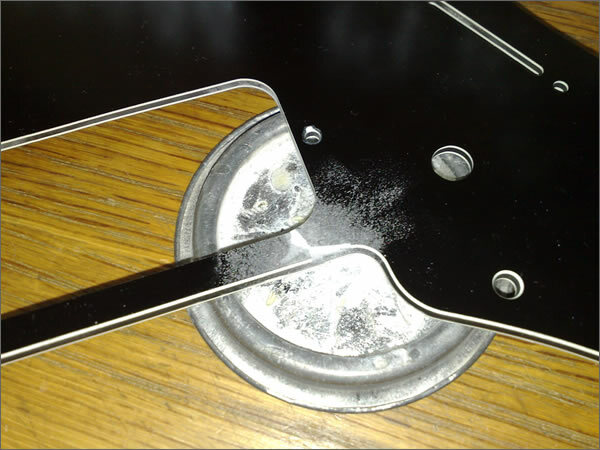 Counterfeiters are taking advantage of Guitar Dater Project and other similar websites by sending in a bulk of fake serial numbers. This data is uploaded and subsequently appears to show that particular serial number as authentic. Olsen warned that there are some easy ways to detect an incorrect reading from the site. â€œIf you come across, say, a â€˜brand newâ€™ guitar, but the serial number tells you itâ€™s anything older than one year ago, question it,â€ he said. Gibson has issued legal notices to the Web site to simply post a disclaimer but they havenâ€™t responded. 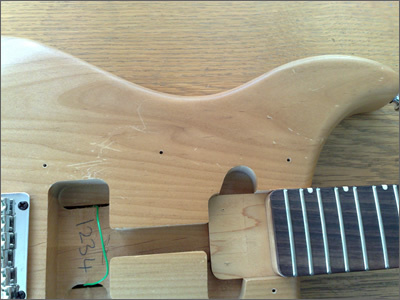 For more information on identifying a guitar by its serial number, click here. This new film (great title!) looks like it will be worth a look..